Only since a few years brain scientists and neurobiologists agree that the concept of lifelong learning is actually possible. Before that, it was believed that at some point in life the human brain assumed an unchangeable state. But it is actually possible to rewire your brain even later in life, especially when learning is fuelled by positive emotions. Additionally, the main reason for the size of the human brain is our capability to perform complex, adaptive movements. I will explain how you can leverage that to re-ignite your hunger to learn new things. Before we go to school as children, we learn on a daily basis. We acquire new skills by imitating the people around us. In the beginning, we practice them, fail, change our practice. Eventually we are able to walk, talk, jump, tie our shoelaces, throw and catch a ball, etc. We do this, because it is in our nature to learn. We’re hungry for progress and new skills without even knowing it. We explore, learn, practice, experience. All by ourselves, because it’s natural for us. It’s part of our innate instincts. If parents act accordingly, infants realise they need to acquire the skill of talking if they want to communicate what they want. They understand why they need to learn it. The same applies for other important skills, like being able to walk on your two legs. Even if an infant doesn’t fully grasp the consequences, he will explore his possibilities and slowly progress towards this new skill. Especially at this young age, we learn a lot of motor-skills that shape our basic movement patterns. When we enter primary school, this all changes. In the beginning, it’s still about learning new skills, like reading and writing. And at this point, it’s still clear to us, why we need these skills in life. Bit by bit, this changes. More and more we’re moving away from a skill-based learning to a knowledge-based learning approach. The explanation we get sometimes is as short as “You need to know this.” The “why” becomes more and more unclear. Well, because we need to know certain things just for the next test. Afterwards, we can forget it again. I don’t need to tell you how demotivating this is for the learning process. Moreover, while we learn all this, we sit. When we sit, the motor cortex of our brain can go in an idle state. We don’t have to balance our center of gravity any more. When we’re standing or walking, our brain activity is significantly higher. Our brain is not designed to consume and reproduce knowledge. Of course, we’re able to do that – that’s why our school system has survived for so long. But, by this approach, students have a negative attitude towards learning when they finish school. Because “learning” becomes pumping information in your brain and spitting it out when you’re asked for it. Our brain is a highly developed problem-solving machine, not a rewritable phone register. So what happened that our hunger to learn was turned into this negative feeling? Where is that initial drive to learn and progress on a daily basis that was so natural for us as toddlers? We need to rediscover that! What happened in the meantime is, that we associate “learning” with “learning knowledge”. That means mostly pumping books worth of information in our brains. I am not saying that knowledge is bad, don’t get me wrong. Of course it’s absolutely necessary and can be very useful if you have the skill to apply your knowledge appropriately. But it is only beneficial and sustainable when it happens under the right circumstances. Remember, earlier “learning” was associated with progress, with actually learning new skills. There was always a clear “why” behind every learning experience. That creates fireworks in our brains, drives us naturally towards more learning and clearly motivates us. You might not remember what it felt like, but I’m sure you were extremely excited and your parents cried when you stumbled a few steps on your then tiny legs for the very first time. This emotion is what keeps us going, that is how our brains are wired. Additionally, anything you experience with enthusiasm will be ingrained in your brain. “Motivation” doesn’t come from motivational quotes, it comes from our desire for positive emotions. Motivational quotes try to tap into that, but only a successful learning experience can actually ignite that emotional firework. That is why we need to learn how to enjoy learning again. Later in life, it’s mainly your skills that determine whether you’re successful. Knowledge can be acquired by anyone at any time (given he has the basic skills to learn and remember). But when you have the right skills, life is easier. The best thing about this is – it is never too late to learn new skills. Remember – your brain can be rewired at every age to learn a new skill. I believe it’s one of the most fundamental things in life to take every day as a lesson and learn from your experiences. Pumping knowledge in your brain doesn’t change the way your brain is wired. It’s basically just additional files on your hard drive that you can pull out when asked. Learning and practicing a new skill, however, is like installing a new software. You will be able to do things you weren’t able to do before. And it doesn’t matter whether it’s a motor skill like catching a ball or if it’s being able to play chess. Of course, if a motor skill involves the complex coordination of a number of body parts, the effect on the central nervous system is likely to be bigger. But every new skill actually changes the wiring of your brain. That’s the reason why it’s really hard to forget how to ride a bike, or how to write – even if you haven’t done it for a while. Motor skills make the learning process really evident. They can be practiced and the progress can clearly be monitored. 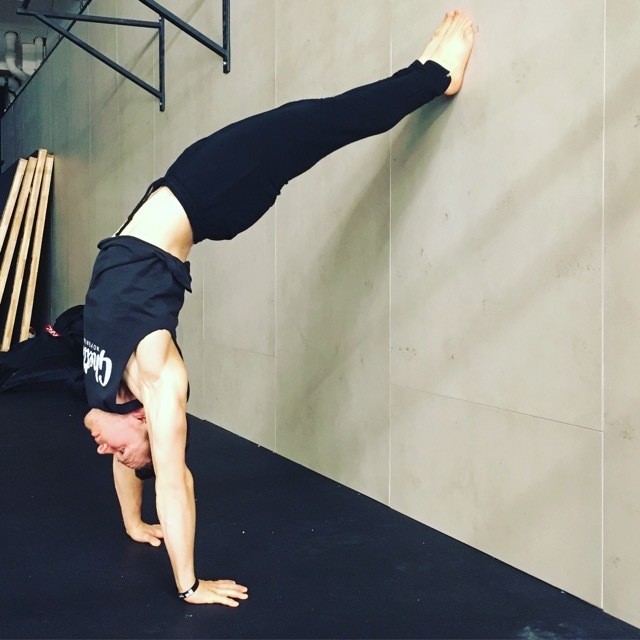 The handstand is a good example – because the path of progression is easy to monitor. Another example that is a bit harder to measure is being able to move with “flow”, the way that good dancers do. That is also something you can practice, but it consists of a lot more elements and is more complicated to learn. But, I believe that when you constantly try to learn new skills, especially movements, you can begin to love the process of learning again. You start feeling the hunger to explore, learn and progress again – like you did when you were a child. And you will get the same desire for learning in other parts of your life. I want to teach people how to integrate the mindset of lifelong learning in their lifestyle, based on learning new movements from all sorts of disciplines.